The Number 1 New Years Resolution is to spend more time with the family. With our busy and hectic lifestyles it seems like work always comes first and many people just don’t seem to spend enough quality time with their family. These articles can be used on your blog or they can be used to promote a number of family related products from Amazon. These articles can be used on your own blog or website or can be rewritten and then submitted to article directories. If you are in the self help or panic disorder niche then these are the articles you need for your business. These articles range between 300 and 700 words each. 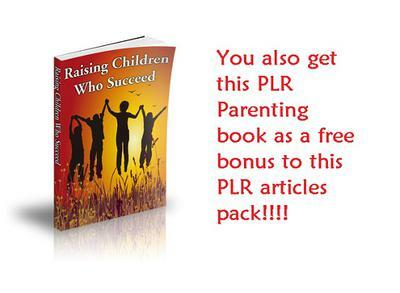 And you also get a free bonus PLR parenting book to help you build your list or to sell for profit! Just $10 for the full pack, that is just $1 per article, a very small price to save you the time of writing these articles yourself. On Sale - For just $10 you will receive your articles in just a few minutes and can put them to work straight away.